Olympus launches the latest version of its workflow-orientated materials science imaging software, Stream 1.9. Introducing dedicated functions to streamline specific tasks including automatic measurement and coating thickness evaluation, Stream 1.9 manages the complete imaging process. Promoting efficiency and flexibility in the imaging workflow and with expanded measurement and analysis functions, the latest OLYMPUS Stream 1.9 provides innovative, easy-to-use solutions for industrial and materials science microscopy applications. An operating system for a range of Olympus microscopes, including both upright systems (e.g. the BX51) and stereomicroscopes (e.g. the SZX10), the software includes new predefined measurement and analysis options. Including ‘Coating Thickness’ and ‘Automatic Measurement’, these features enable the easy execution of specific tasks, thereby improving workflow efficiency. As thickness is the most important variable affecting coating quality, the new dedicated Coating Thickness solution determines thickness quickly and easily using the rapid and reliable Calotest method (also known as the Ball Crater method). The fast Automatic Measurement solution for edge-detection-based measurements using pattern recognition is able to perform multiple measurements in a single live image, greatly improving efficiency. This includes a validation tool that provides a pass/fail flag for every measurement. All in all, Stream 1.9 contains more than 50 measurement and analysis functions based on the most up-to-date standards. For quality assessment of steel and cast iron, the dedicated Cast Iron solution measures graphite nodularity by size, shape and distribution, with results automatically generated according to international standards. The popular software makes advanced analysis and reporting options fast and simple regardless of user expertise, offering step-by-step guidance for each task. 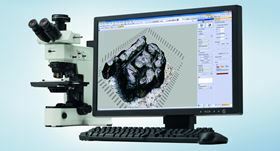 OLYMPUS Stream 1.9 covers the control of the microscope, cameras and accessories, image acquisition and processing, measurement and analysis, as well as report generation and data management, making it the most comprehensive software on the market. Flexibility and future-proofing are key features with four expandable packages available: Start, Basics, Essentials and Motion, allowing users to create and grow their system to suit individual requirements and future applications. OLYMPUS Stream 1.9 also features highly effective image acquisition and processing capabilities such as high dynamic range, extended focus image and tilt compensation, enhancing image quality for more detailed inspection and analysis. These functions are complemented by a comprehensive range of analysis options, which include both standard measurement types (e.g. lengths and angles), as well as more complex threshold-based methods (e.g. phase analysis, grain analysis, porosity and particle distribution). For easy integration into existing workflows, the software now offers full Windows 8 and Microsoft Office compatibility. This valuable capability allows the export of tables and graphs into Microsoft Excel for statistical analysis, as well as the use of Microsoft Word and PowerPoint for the generation of professional reports and presentations. To discover the full extent of OLYMPUS Stream 1.9 functions and capabilities please visit the website. This story is reprinted from material from Olympus, with editorial changes made by Materials Today. The views expressed in this article do not necessarily represent those of Elsevier.